The year is coming to an end. 2017 has been full of twists and turns. 2018 is looking like it will certainly be an interesting one. Certainly one of potential change. To all of you, I wish you a happy and prosperous New Year. I also wish you would read all of these review articles. This week we have: Dragon Pets, Too Many Bones, Circle the Wagons, Shipwrights of the North Sea, The Ruhr: A Story of Coal, Pile-Up Rush, and Summit. theMCGuiRE review takes a look at Dragon Pets another great title from Japanime Games! In this title you are hunting for dragons and trying to breed as many as possible for the win! Great mechanics, excellent components, fantastic artwork and fun for kids and adults. In this video I will teach you how to play including: components, Player, board and combat setup, phases of a round, end game conditions and combat. I will also give you my thoughts and opinions on the game, and would love to hear yours. Button Shy Games has got a thing for small packages. They’re producing a line of wallet-sized games with themes as varied as gamers could hope for. Each game comes in a faux-leather wallet and usually relies on the placement of cards or other thin components. Playtimes and player counts are also on the low end typically. 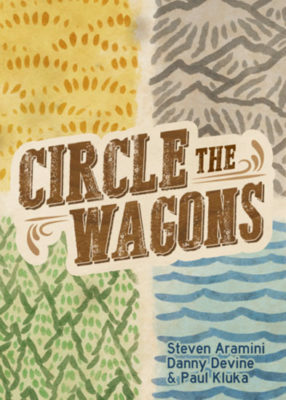 Circle the Wagons is one of many offerings in this line. Players take the role of town architects in the pioneer days hoping to outdo their opponent in points by playing landscape cards in configurations to get the most points. As a two-player card drafting game, a single play goes fast in just 15 minutes. Three of those games are designed by Shem Phillips. His game design credits go back to 2009, but he’s made a name for himself recently with the release of a trilogy of Viking themed games. 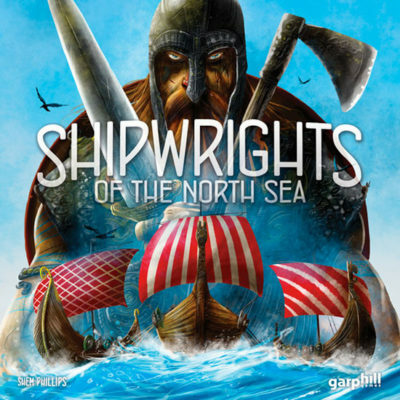 The first of these is Shipwrights of the North Sea, a card game with drafting and resource management for 2-5 players. When played with 2 players, the best player count, it takes an hour. Higher player counts can take up to 90 minutes. 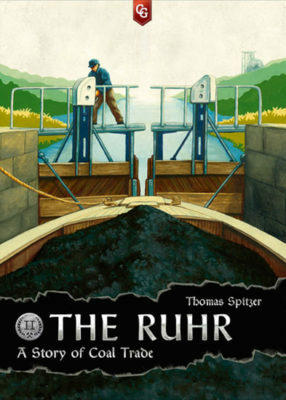 For 2017, Thomas Spitzer and Capstone Games have released the game’s second edition as the second game in their Coal Trilogy (the first being Haspelknecht) under the new name The Ruhr: A Story of Coal. As a bonus, the team had also packaged it with a standalone expansion called The Ohio 1811-1861. The Ruhr: A Story of Coal is a pick-up-and-deliver/worker placement game for 2-4 players that takes between 90 and 120 minutes to play. It plays best with 4 players. Put your stacking and building skills to the ultimate test in Pile-Up Rush. 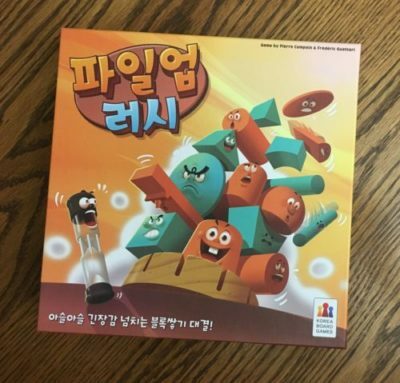 The goal is to construct a tower and be the first player or team to win four building blocks from your opponent, all while under the pressure of the clock. Or sand timer. Each player or team begins with an identical set of ten blocks in odd shapes and varying sizes. They will stack these in alternating turns on a round base. The starting player begins the sand timer and, with one hand, may place up to three of their blocks on the base…before time runs out. As soon as they decide they’re done, they flip the timer and the next player/team hurries to add to the tower, this time placing as many blocks as they wish before the sand empties. Builders may only use one hand and cannot touch any piece already in play, though they may use their current block to nudge or orient other bits already stacked. In a competitive game, players race up and down the deadly mountain while managing their resources, building their path, overcoming obstacles, and attempting to survive their competition. Summit uses a unique karma system that allows players to actively help or hinder their opponents — but it also affects end game scoring. For a few extra points, you could share some of your valuable food or oxygen, or maybe you can afford to lose some points so you choose to cut their rope and watch them disappear down the mountain.